Ruth Page Jones narrowly won the Democratic primary in the 97th district. 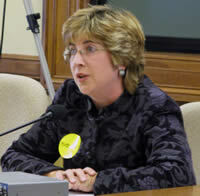 She is President of the Wisconsin Alliance for Excellent Schools, Activist in Project ABC-Waukesha, longtime champion of school finance reform and a friend (see her testimony before the State Senate Education Committee here). If you believe that changing the way Wisconsin funds schools needs to be a priority, then help Ruth defeat Bill Kramer in November. And don’t forget the “Building a pro-education Democratic Majority” event in Madison on Thursday, September 18. Closer to home, Kelda Roys won the 81st Primary in Dane County. All indications are that she will also work for change in school funding.